Third degree atrioventricular block is also known as complete heart block because there is complete failure of conduction between the atria and the ventricles. As a result of this there is complete independence between atrial and ventricular contractions. It is thus one type of AV dissociation. 3) the P waves bear no relation to the QRS complexes and thus the PR intervals are completely variable. Since there is a block in the conduction, a subsidiary pacemaker will take over the function to make the ventricles contract. Depending at the level of block we can have different QRS complex morphologies. Below is an ECG showing a complete heart block with the block occurring proximal to the His bundle, usually in congenital cases. The QRS complexes are narrow and the ventricular rate is around 40/min. 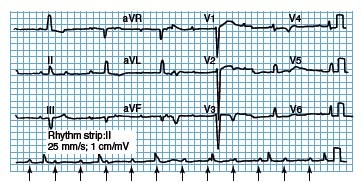 The ECG shown below is in an acquired case of complete heart block. The QRS complexes are wide indicating that the block is distal to the bundle of His. The arrows indicate the P waves. The latter are regularly placed and are either alone or mixed with other waves.